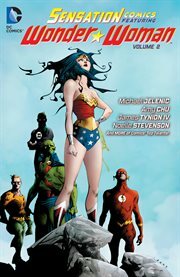 The item Sensation Comics featuring Wonder Woman, Issue 6-10, Michael Jelenic, Adam P. Knave, Alex de Campi, Amy Chu, James Tynion IV (and five others), writers ; Matthew Dow Smith, Drew Johnson, Ray Snyder, Neil Googe, Bernard Chang, Noelle Stevenson (and six others), artists ; Lizzy John, Rex Lokus (and five others), colorists ; Saida Temofonte, Deron Bennett, Todd Klein, letterers ; Jae Lee with June Chung, collection cover artists, (ebook) represents a specific, individual, material embodiment of a distinct intellectual or artistic creation found in Charlotte Mecklenburg Library. In these stories, Hippolyta's first rule of war is demonstrated as Diana and Cheetah battle over a phoenix egg. Then, Diana agreed to represent the Justice League on a space mission-until kaiju attack! Plus, see a teenaged Diana visit Man's World while her Amazon bodyguards try to track her down!